Check out the VersaLink C405 Color Laser All-in-One Printer. Starting at $699. Save 10% on supplies with your VersaLink B405 purchase (available at checkout). Right out of the box, you'll count on your Xerox® VersaLink B405 black-and-white multifunction printer to consistently and flawlessly perform the tasks that make your business work more efficiently. From IT-free installation wizards, to step-by-step configuration options, you're ready to go—hassle free. The VersaLink B405 all-in-one printer is loaded with features and time-saving Xerox technologies designed to speed up information sharing and reduce inefficient workflows. Ensure information accuracy with Scan and Fax preview, and do more with scanned documents with built-in optical character recognition (OCR). Print with total peace of mind knowing that the VersaLink B405 monochrome all-in-one printer delivers a spectrum of stringent security features, including Secure Print, Secure Fax, Secure Email, Secure Scan, and card authentication to control access. An entirely new way to work. Preloaded Xerox® ConnectKey® Apps help optimize office efficiency, and on-screen access to the extensive Xerox® App Gallery provides expanded functionality—like the Xerox® Easy Translator Service app, which quickly translates scanned documents into numerous languages. 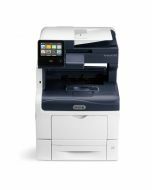 The Xerox® VersaLink B405 multifunction printer gives you the freedom to work where and how you want—with direct connectivity to Google Drive™, Microsoft® OneDrive® and DropBox™, and access to additional options through the Xerox® App Gallery. 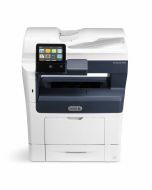 The ability to connect and print from multiple devices is key for today's worker, and the VersaLink B405 multifunction printer meets the challenge with optional Wi-Fi and Wi-Fi Direct, plus Apple® AirPrint®, Google Cloud Print™, Xerox® Print Service Plug-in for Android™, Near Field Communication (NFC) Tap-to-Pair and Mopria. Product Size Dimensions (WxDxH): 19.5 x 19.5 x 21.7 in. ; Weight: 48 lb.